Sorry guys, but I am a bit behind with the entries lately. 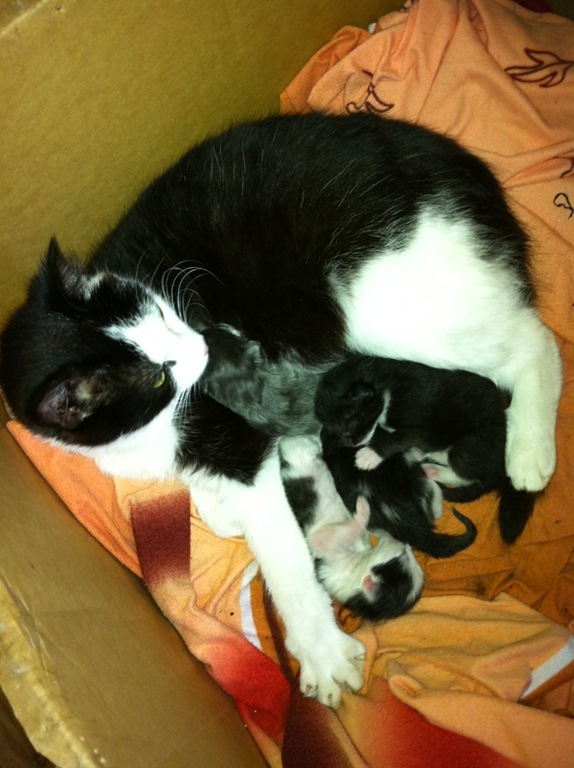 The first thing i wanted to tell you was Missy got her kittens! We came back last Monday night and she must have had them that night. Anyway when I was on lunch the following day, she came over and brought one of the kittens with her. Sooo cute! She must be trusting us. At the end of the day when I finished work I went into the shed and there was Missy with 4 kittens! They are probably about a week old now. Gaining their weight, drinking milk from mummy. So they are healthy kittens. They haven’t opened their eyes yet but should be happening tomorrow or Tuesday I’d say. Missy is always by their side and barely leaves them. I do leave her out for a bit to get some air and walk around in the garden. Other than that the shed door needs to be closed as random cats, plus the kittens father, walk into our garden and no one should really touch them. I keep you up to date when they open their eyes and stuff like that.